For the past fifteen years, computer and software companies have been the toast of venture capitalists and the focus of the VC market. The (usually) quick ramp-up period, eager IPO market, and sheer technological growth in the industry insured this. Things have changed. Take a look at the viz below to see why. It just isn't 2000 anymore. The IPO market is so flat even Facebook refuses to go public. Technological growth in the software industry has been interesting, but not necessarily earth moving (except in the case of a BI start-up named Tableau, of course). 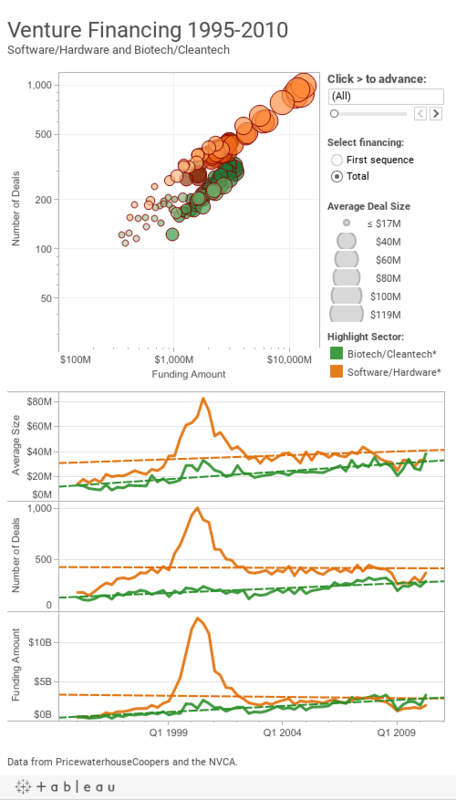 As you can see in this viz, over the past three years venture funding for biotech and cleantech firms has been consistently higher than for software and hardware firms. Apparently, investors feel that both the exit prospects and technological future in biotech/cleantech is just as attractive, if not more attractive than software. Thanks to Paul Kedrosky for the data and idea.